Another travelling exhibition is that of the Enchanted Rings (De BetoveRING). These rings can be seen from June 27th 2010 to August 29th at the Museum of Enamel and Glass Art in Ravenstein, The Netherlands. 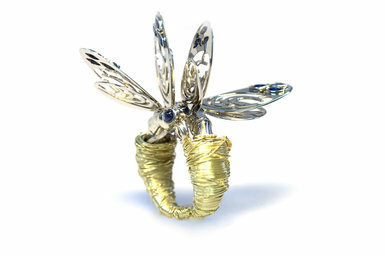 The Dutch Society of Gold- and Silver smiths (VGZ) and the Dutch Board for Craft Trades (HBA) have organized the 4th annual design contest for gold- and silversmiths, with Enchanted Rings (De BetoveRING) as its theme. 18 out of 78 designs were nominated. As the theme prescribes they all have to do with fairytales. We see frogs, castles, dancing shoes, caleidoscopes, ponds, waterlillies, secret compartments, see troughs and wonderful craftmanship. Winner of the contest was Eva Theuerzeit of Brans Almelo BV. 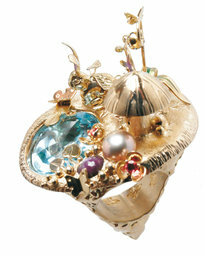 Theuerzeit’s ring features a highly detailed fantasy landscape surrounding an aquamarine pond. Third runner up was Joeri Dijkman from Metal Art in Alkmaar. 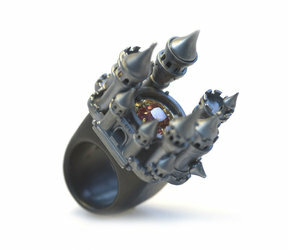 Joeri’s music ring is my personal favorite; a ring with a very industrial look to it that is part of a melody box. The ring is also the heart of the design because the positioning of the diamonds (up side down!) 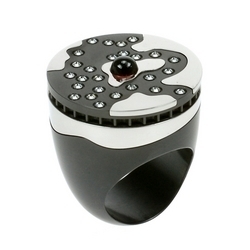 and the cabochon ruby defines the melody of the music box. Other materials used were black zirconium, steel, titanium and wood. The music box cost EUR 7000,- and up. The tune it plays was composed by harpist Klaartje Broers. Click below to see and hear Joeri demonstrate his ring! This entry was posted in Contemporary Design, Exhibitions and tagged de BetoveRING, Diamonds, innovative jewellery design, metal art, Museum of enamel and glass, music box, Vereniging goud en zilver. Bookmark the permalink.